Oh Julie I just love it! Your niece is going to be so thrilled - is it a complete surprise? 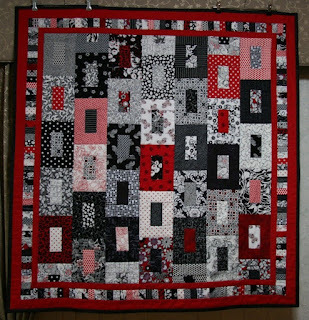 I love the scrappy border, lots of tiny pieces, that must have taken ages. How did you quilt it in the end? Hard to see from the photograph. You must get a photo of her reaction when she opens it, and an 'in situ' photo too!! Julie you are an inspiration. Your quilt is beautiful, I am sure that your niece will treasure it for years to come. I am an on line antique dealer in England who is passionate about antique textiles. I happened upon on your blog whilst researching a pair of Chinese childrens boots. I think that you own a similar pair. You were so lucky to live and travel in Asia. You must have seen some breathtaking embroideries on your travels. I only wish that I could sew. My mother was an expert with needle and thread, sadly as a child I was not that interested. Now, 40 years on I so regret not asking her to teach me. Sadly, Mum is not with us anymore, I shall have to suffice with looking at and handling beautiful textiles rather than creating them. Keep up the blog, your love and enthusiasm for your work shines through and congratulations on passing your exam. It's fab Julie! I'm sure it will be loved as much as the love it gives. It's a beautiful quilt Julie, and so much work with the small blocks and border, your niece wil be thrilled, it's such a personal gift.